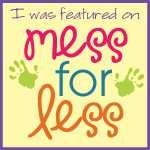 It is no secret that Skyler LOVES his ECFE class! 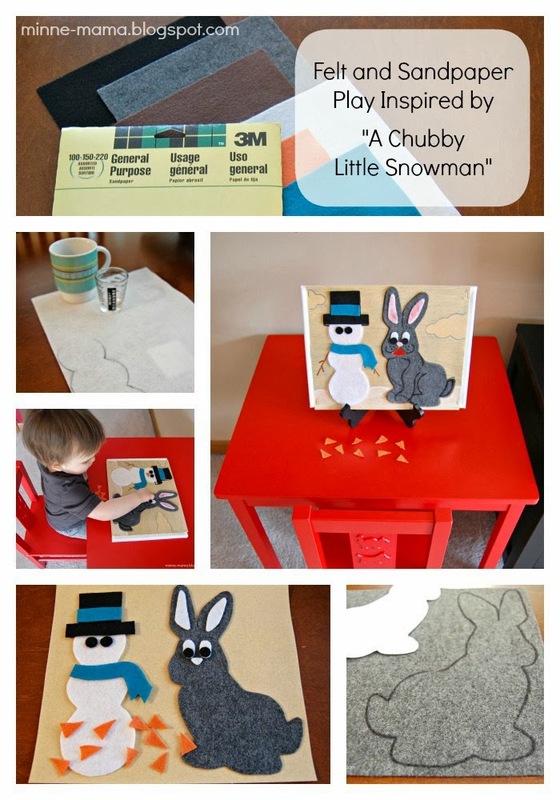 I have posted pictures and another craft inspired by the wonderful program we are in. This week we had a pajama day, and Skyler was so thrilled to be in class he could hardly decide what he wanted to do - so much to choose from! He ended up going down the slide a lot, putting "Pom poms!!!" in a muffin tin and through paper towel rolls, and trying out the easel for the first time! They also had play dough with rolling pins and chalk/construction paper to experiment with. It is a favorite time of the week for both of us! We start the class with thirty minutes of play time/parent interaction and then do a fifteen minute circle time with songs and rhymes before we leave the room for the separation and parent education half of the class! 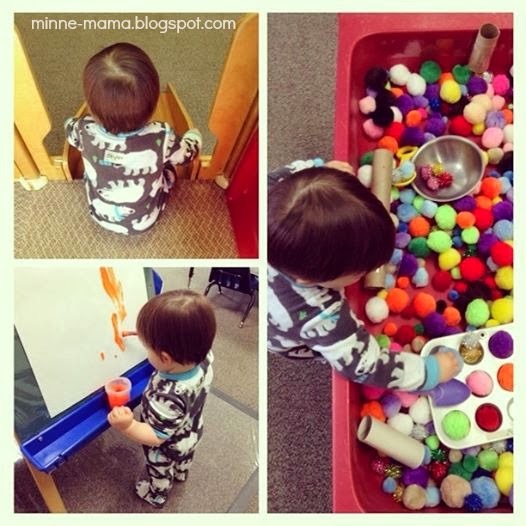 This activity is based on a rhyme we have done in circle time the past few weeks. 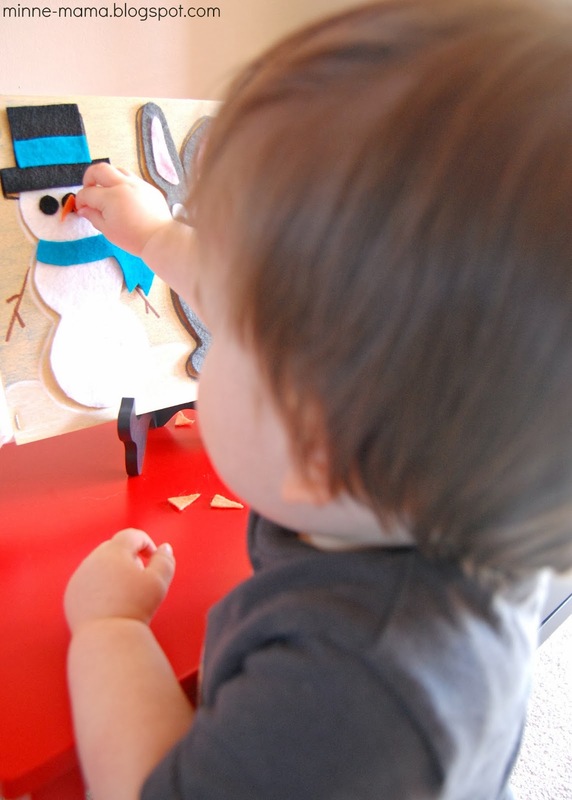 "A Chubby Little Snowman" was a new rhyme for me, and Skyler really enjoys it - he loves both snowmen and bunnies, so it is a win all around for my little guy. 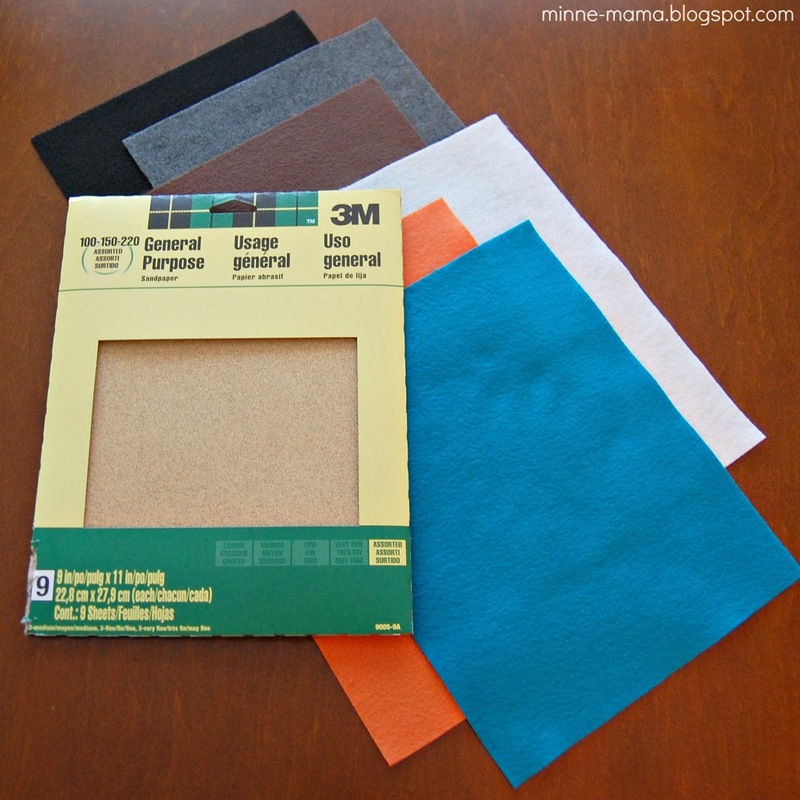 After seeing this sandpaper and felt matching game from No Time For Flashcards, I have been more motivated to make a felt board for Skyler. 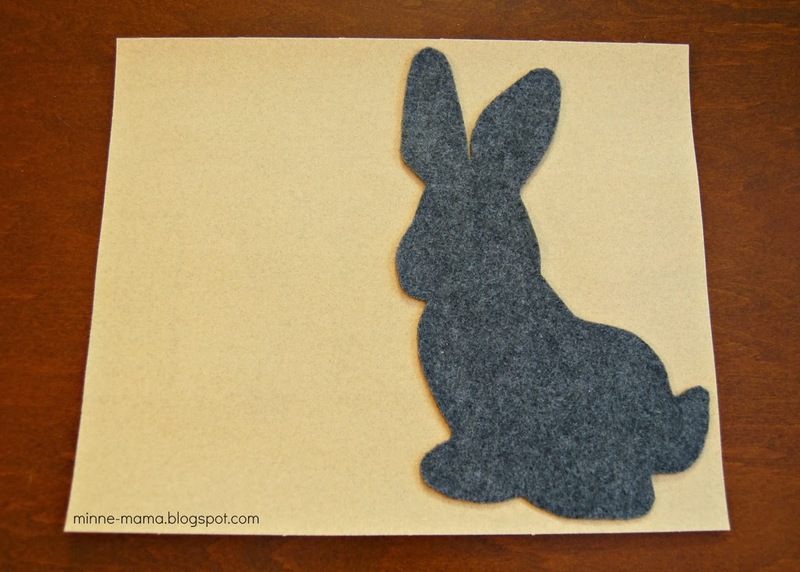 I see them a lot and like the idea of using felt on felt, but I loved the idea of felt on sandpaper and being able to draw underneath the shapes! When we started this rhyme in ECFE, the two ideas merged in my head and I was ready to start working on this simple and fun puzzle to bring a little bit of our beloved class home! 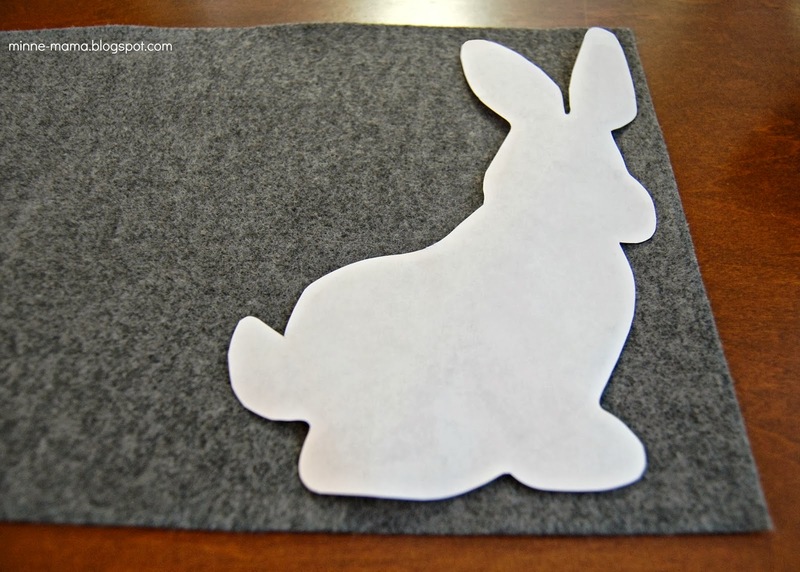 To start our board, I traced a picture of a rabbit that I had printed onto the grey felt (I just did a Google search for "cartoon rabbit" and this is just the outline/back of the image since it is not mine). Then once it was cut out, I flipped it over onto it's place on the sand paper. Then I knew what size of a snowman I could make. I went around to find some circle shapes that would work for that leftover space. Our coffee corner came to the rescue with a small coffee cup (the larger opening made the bottom circle and the bottom of the cup made the center circle!) 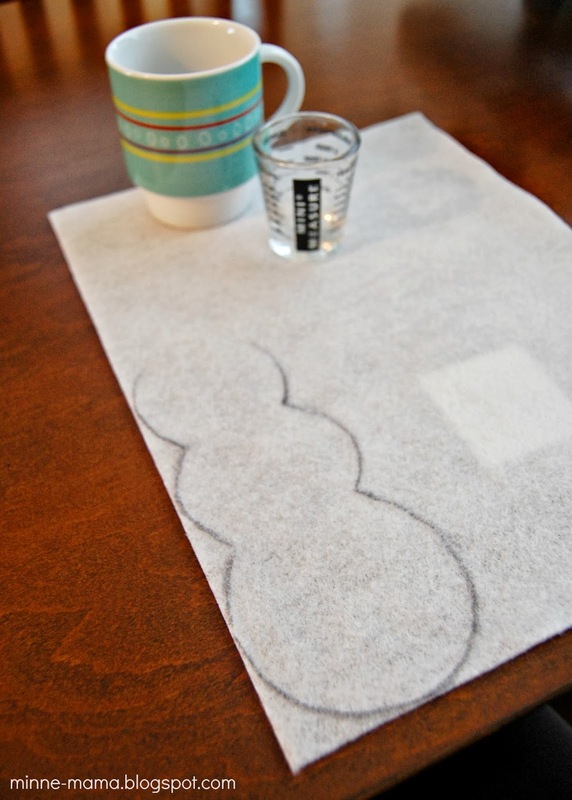 and the mini measure we use for our espresso machine was perfect for the top circle! 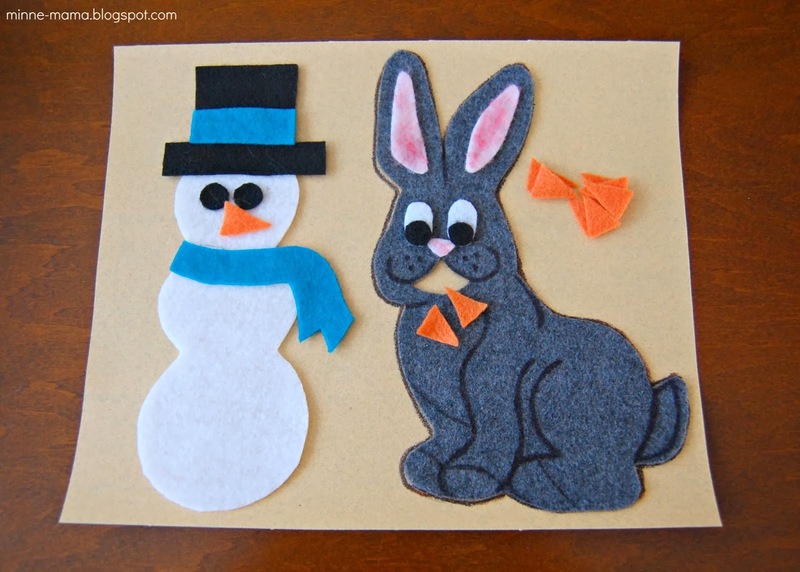 Once the snowman shape was cut out, I made a hat and scarf out of the black and teal felt, as well as eyes for both the bunny and the snowman, and ears and a nose for the bunny. I made a bunch of carrot shapes out of the orange felt at the same time. 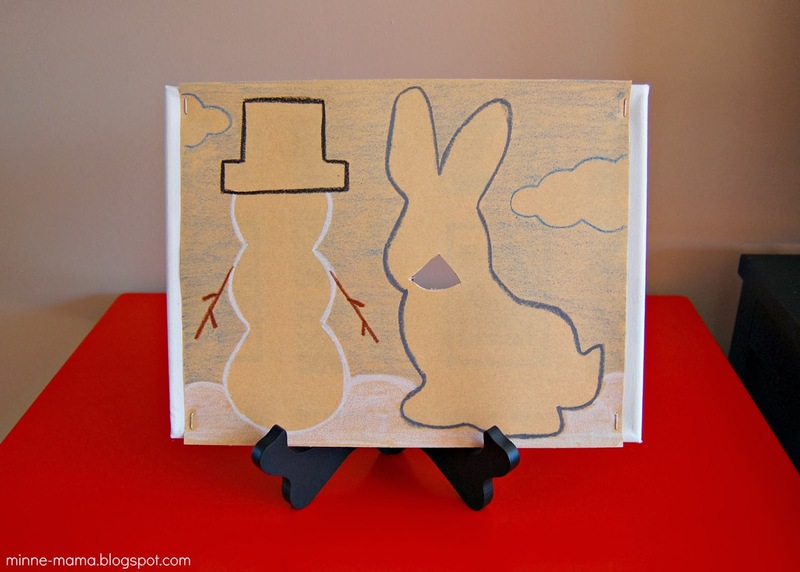 Starting to look like a snowman and bunny! I used my hot glue gun to attach the hat, eyes, inner ears, scarf, and nose, and left the carrots unglued. I also added color to the bunny nose and ears with red crayon and used a sharpie to give it more features. 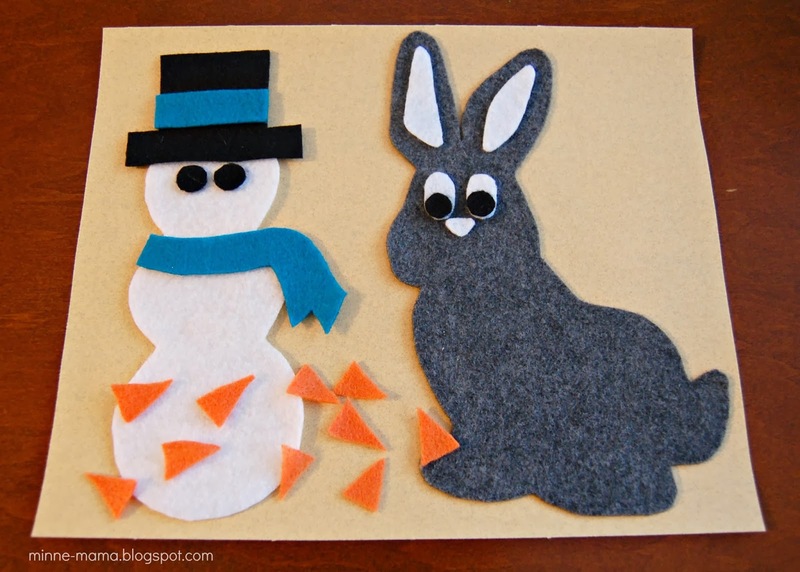 To give our rabbit the ability to eat that snowman's carrot nose, I cut a hole in the grey felt for the mouth! 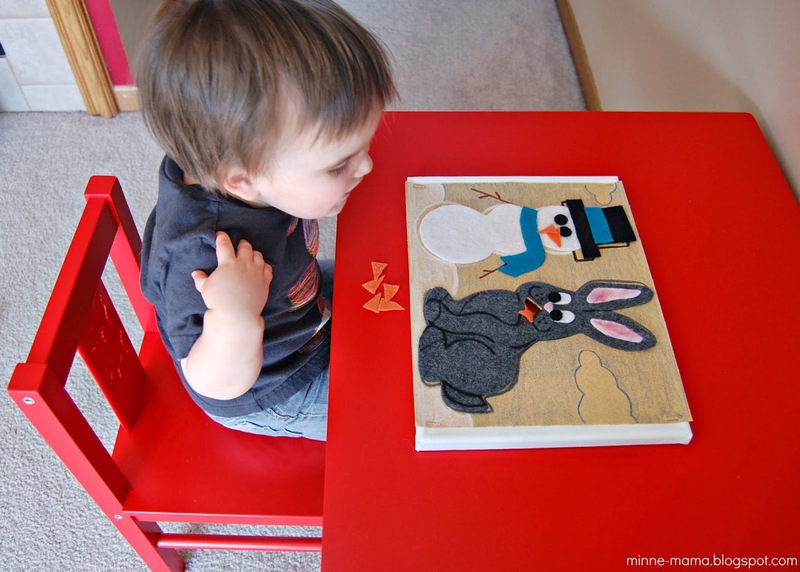 To finish our felt board, I traced the snowman and the bunny on the sandpaper with crayon, added a simple background and then stapled the sandpaper to a canvas so it could stand (I also cut the mouth out on the sandpaper and canvas at this time! 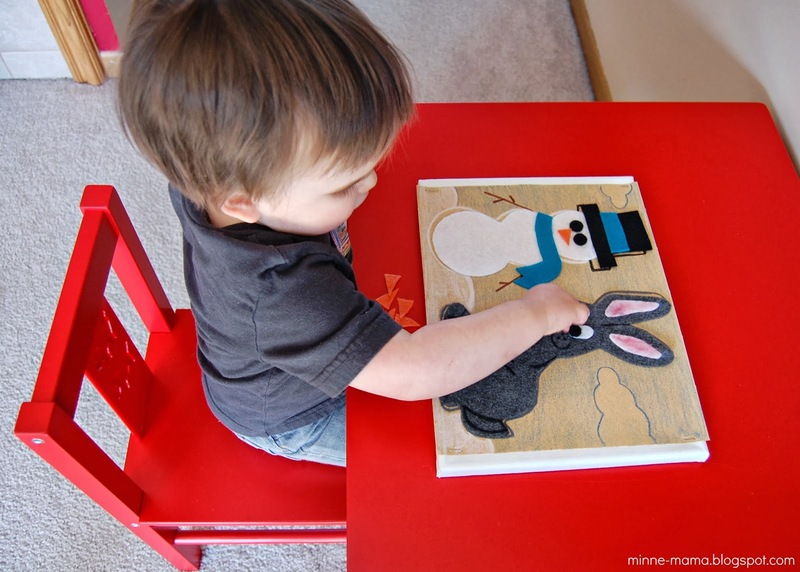 I wrote the rhyme on the back of the canvas and our felt puzzle and activity board was complete! 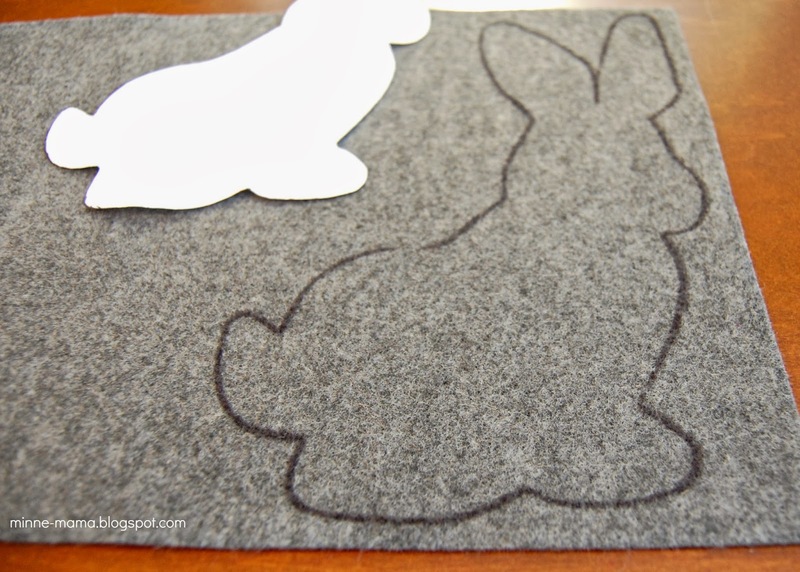 Having the outlines and removable felt pieces makes for a puzzle aspect to this activity! Skyler didn't notice this right away when he came down from his nap, so I walked over to the table while saying the rhyme, putting a carrot on the snowman's face and then picking it off and putting it through the mouth of the bunny and he was very intrigued, running right over to the table to play! 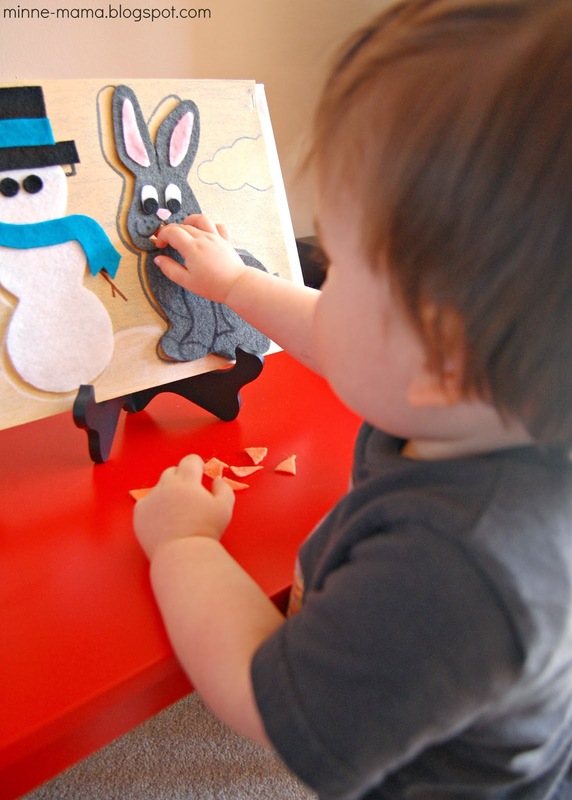 Skyler started off by feeding the bunny many carrots, and then after awhile he gave the snowman a nose as well! I didn't notice that Skyler was completely blurry (luckily, the board is well focused!) 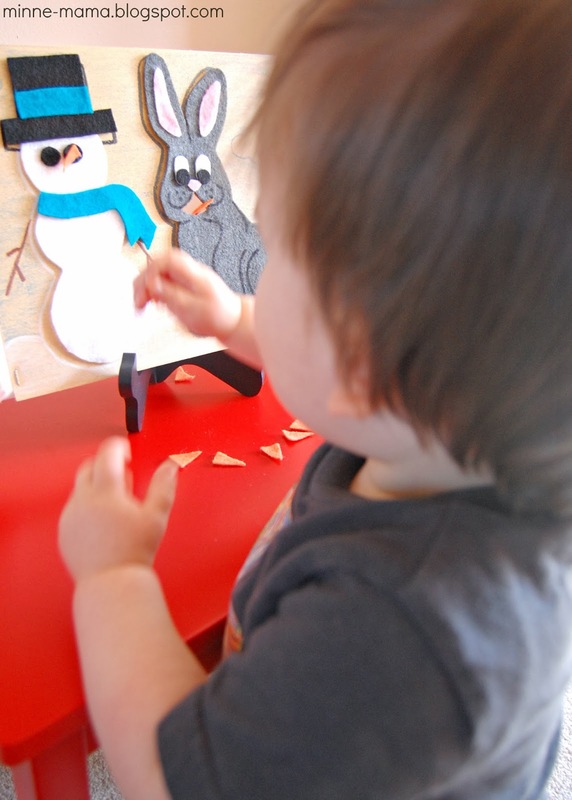 while taking these, but here are his first moments playing with the felt board. 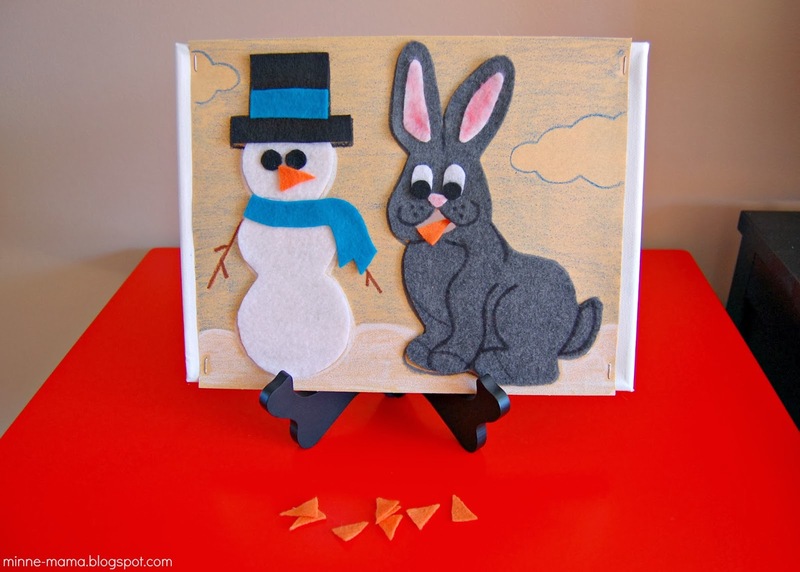 So far, he has not decided to take the felt pieces off, but has spent all of his time using the carrot cut outs to play! For older children, using the plate holder would work really well. It is nice to have the picture upright, but Skyler kept knocking it over accidentally when he would try to feed the pieces through the hole. This was another reason why I attached the sandpaper to the canvas in the first place, both so it would stand well in the plate holder and so the felt pieces would have some space to go when the canvas was down flat! At this point, we just laid the canvas down on the table and then it was much easier to play. 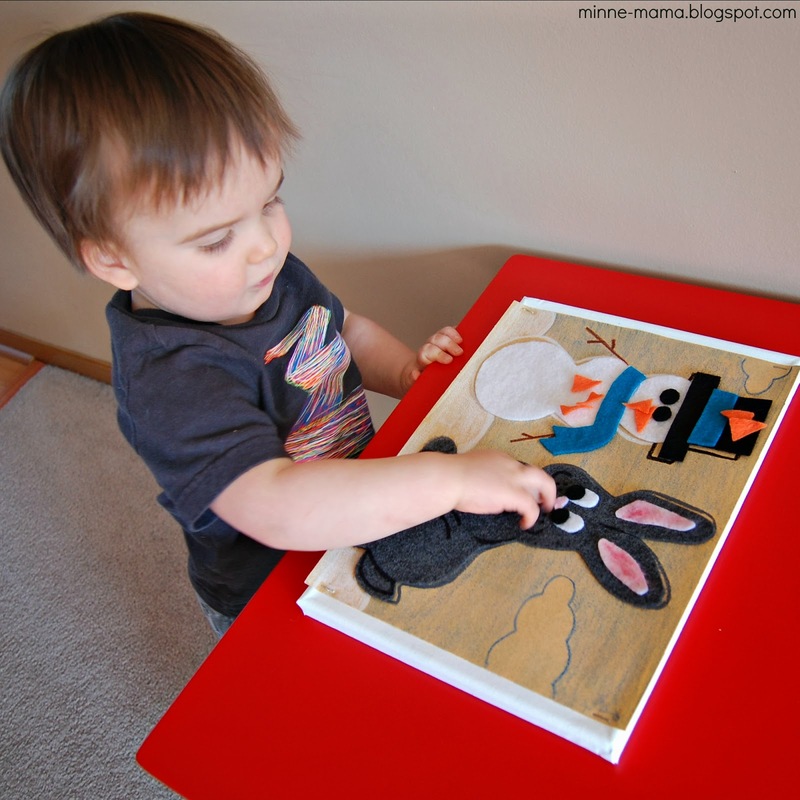 After awhile, he had been putting the carrots either on the face of the snowman or the mouth of the bunny, then I asked if he could give the snowman a bellybutton, or give the snowman some hair, and this is how he responded! 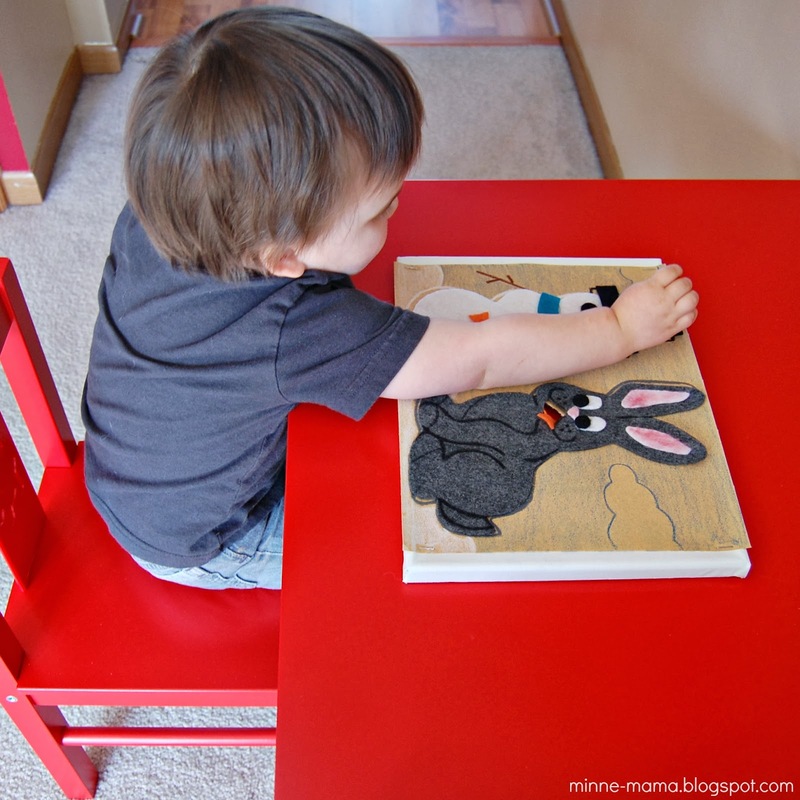 After putting the carrots in silly places, he went back through and fed them all to the bunny! 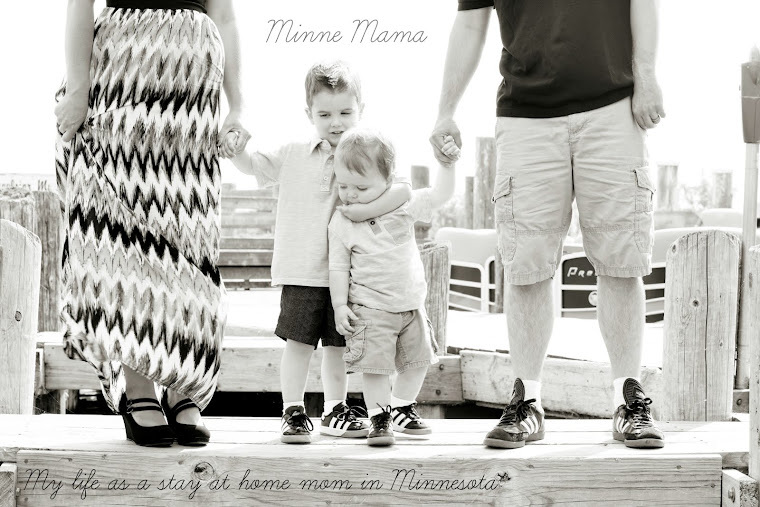 This was so much fun to bring a little piece of our class to home. 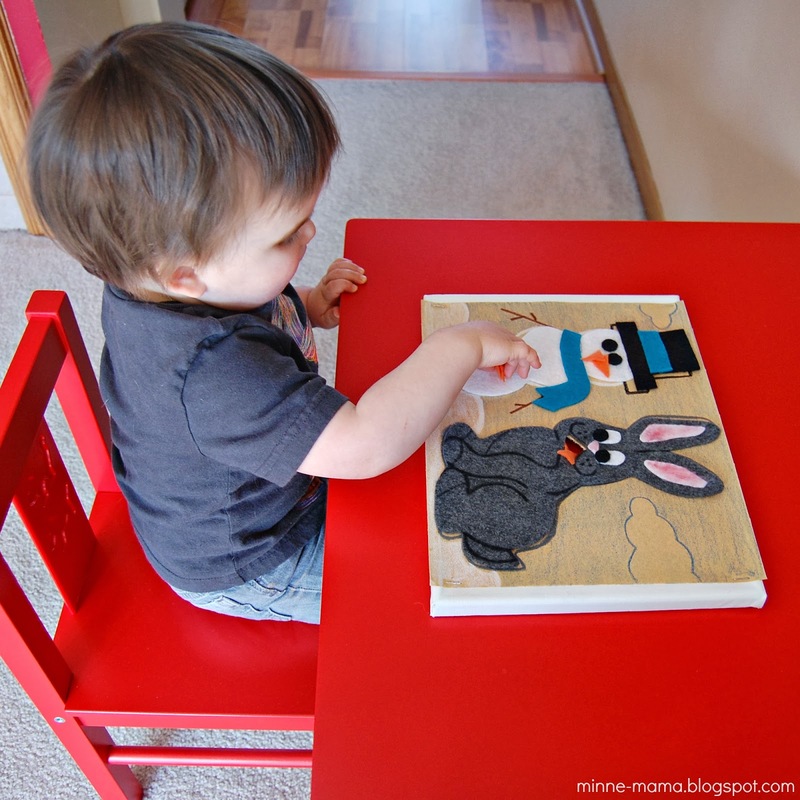 I liked how Skyler spent about equal time placing the carrots on the snowman and feeding them to the rabbit. We talked about the rhyme a lot while playing, and he enjoyed using the pieces to go along with the story.